Beleaguered Democratic Rep. Charlie Rangel of New York dramatically walked out of his own ethics hearing today, after charging the House ethics committee of unfairly denying him the opportunity to retain a lawyer. 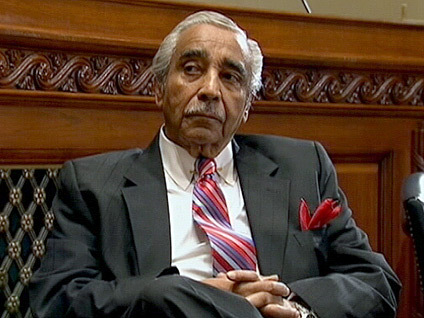 The ethics committtee subpanel serving as Rangel's jurors, however, continued with the hearing and decided they have enough facts to determine whether Rangel is guilty or innocent of the 13 charges of ethics violations against him, without hearing from Rangel or any other witnesses. After reviewing the evidence presented by the House ethics committee's lawyer -- which included more than 550 exhibits -- the eight-member ethics subpanel decided that none of the facts in the case were in dispute. They closed the public hearing to deliberate privately whether Rangel should be charged with any of the 13 violations. Once they make that decision, they will report their decision to the full ethics committee and conduct a separate hearing to determine what disciplinary actions they will recommend, if any. While the ethics subpanel reviewed the evidence against Rangel, the longtime lawmaker was conspicuously absent. Just a little over 30 minutes after the hearing began this morning, Rangel said he had no choice but to remove himself from the proceedings because he had no lawyer. "All I'm asking for is the time to get counsel," Rangel said before walking out. The 80-year-old lawmaker said he parted ways with his legal team this fall because he was unable to afford representation after paying more than $2 million in legal fees so far, over the course of a two-year investigation into his actions. The Washington Post further reports that Rangel and his attorneys clashed over his defense strategy, including Rangel's decision to make a long speech on the House floor over the summer in which he defiantly told his colleagues, "I am not going away." The ethics committee suggested Rangel create a legal defense fund, but he said today he has not had enough time to set it up. "I am being denied a right to have a lawyer right now because I don't have the opportunity to have a legal defense fund set up and because I can't afford another $1 million," Rangel told the ethics subcommittee. "I truly believe I am not being treated fairly." After recessing to consider Rangel's remarks, committee chair Rep. Zoe Lofgren (D-Calif.) said, "Mr. Rangel has repeatedly sought and received committee guidance on how he may pay his legal fees." However, she added that the committee members were "extremely troubled" to hear that Rangel's lawyers left the case shortly before Rangel's trial. Rep. Peter Welch (D-Vt.) added that it was an "astonishing display of profssional irresponsiblity for a law firm... to essentially drain the resources available to pay the firm... and literally on the eve of the hearing, where [Rangel's] fate is in peril, withdraw." Before Rangel left the hearing, however, he also laid the blame on the ethics committee, for insisting on holding the hearings before the lame duck Congress ends its session this December. "I would want you to know that I don't think it's fair that I participate in any type of proceeding if, in fact, what you are basically telling me is that the political calendar will not allow me enough time to get lawyer at this crucial time," he said. "I think we ought to find the time. What prevents us from doing it?" Furthermore, Rangel said he would not represent himself. "I've been a lawyer here long enough to know it is very, very unwise for any person... to be his own lawyer in a proceeding like this," he said. Rangel released a statement this afternoon saying he was "very disappointed" with the ethics panel's decision to proceed with the hearings. He said the committee "can do what they will with me because they have the power and I have no real chance of fighting back." Rangel this morning reminded the committee group that he urged them to hold the hearings earlier in the year -- in the midst of the congressional campaign season. Rangel managed to fend off a primary challenge and win re-election for a 21st term this month. "I had hoped you would do it before the Democratic primary. It would have been helpful if you had done it before the general election," Rangel said today. "I have been begging that my colleagues in the Congress, my constituents, my family have the opportunity to hear this." The charges of ethics violations against Rangel are related to his personal finances and his fundraising efforts for a new center at New York City College. The ethics committee's lawyer, R. Blake Chisam, argued the committee was prepared to make its judgment because the facts were indisputable. "The facts here are the facts," he said. "The omissions are the omissions. The inaccuracies are the inaccuracies." While Chism argued the facts could not be questioned, he demonstrated that the judgments derived from the facts could vary. In one instance, Republican Rep. Michael McCaul of Texas questioned Chism about evidence indicating that Rangel knew he received income from the Punta Cana Yacht Club, even though he failed to report it. Chism responded, "These documents... show clearly the repsondent was told he had income and... told them where to send that money. That's unequivocal. He knew and he failed repeatedly to report his income." Watch CBS News political analyst John Dickerson and Politics365.com's Charles Ellison discuss the Rangel trial with Washington Unplugged moderator Bob Schieffer, at left. Later, Democratic Rep. G.K. Butterfield of North Carolina asked Chism, "Do you see any evidence of personal financial benefit or corruption?" Chism answered, "I see no evidence of corruption. It's hard to answer the question peronsal financial benefit. I think the short answer is probably no." Rather, Chism said, he suspected Rangel was "sloppy" in his personal finances. He could have easily solicited donations for the Rangel Center at New York City College in an appropriate manner, for instance, if he had followed some simple rules. Rangel has been mired in ethics charges for some time. Earlier this year he gave up his powerful post as chairman of the Ways and Means Committee after coming under scrutiny for corporate-funded travel in a separate ethics case. After Rangel's case is heard, the ethics committee is slated to hold hearings on charges against Democratic Rep. Maxine Waters of California, who is accused of improperly using her influence to help a local bank get federal bailout funds. Update, 5:45 p.m.: The ethics committee subpanel has recessed and will reconvene to continue deliberating the charges against Rangel tomorrow.